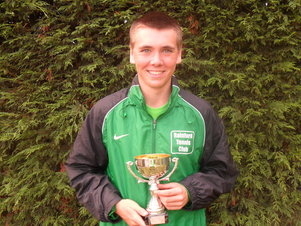 Conor Porteus won three titles at today’s finals day at the 2011 Rainford Tennis Club Tournament at the Jubilee Recreation Ground. The 17 year old started the day winning the Men’s Singles winning a close match against team mate Andrew Corish in front of a packed crowd. Conor won the match 7-5, 7-6 on Court 1. Porteus then teamed with Dave Hillier to win the Men’s Doubles beating the team of Rob Jones and John Machin, 6-3, 6-2. The third and final title of the day was the Boy’s Singles, where Conor edged past Sam Sheen by a scoreline of 6-1, 6-3. to lift his third trophy of the day. The first match of the day saw Maisie Lavelle winning the John Case Trophy, which is for the Club’s Mini Tennis players. Maisie won the match 4-1, 4-1 against Rebecca Duffy.